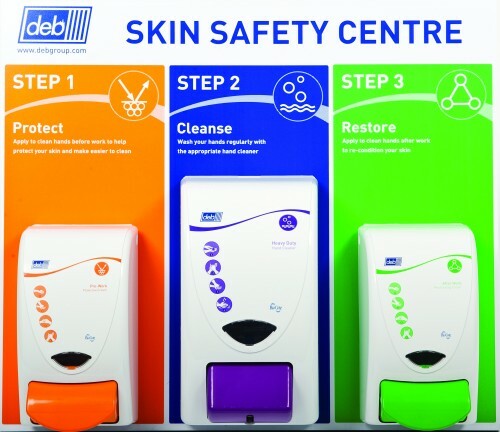 Deb's Skin Safety Centres are convenient, instructional, robust, lightweight boards that are ready-assembled with appropriate Deb dispensers. 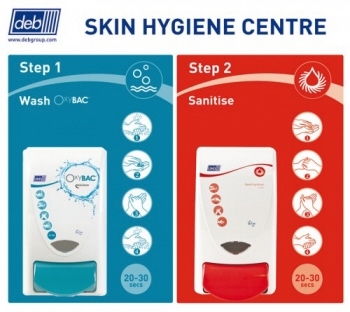 Deb 3-Step Skin Protection Centre - Small provides an easily mountable board with 3 different deb dispensers on it. It provides a 1L Protect dispenser for the application of barrier creams and/or sunscreen. It also has 2L hand cleansing Dispenser. Finally it has a 1L Restore Dispenser for the application of an afterwork cream. Deb 3-Step Skin Protection Centre - Large where everything is needed for clean healthy skin in one location. 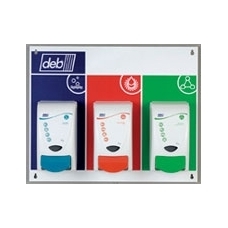 It provides an easily mountable board with 4 different deb dispensers on it. It provides a Protect 1 litre dispenser for the application of barrier creams and/or sunscreen. 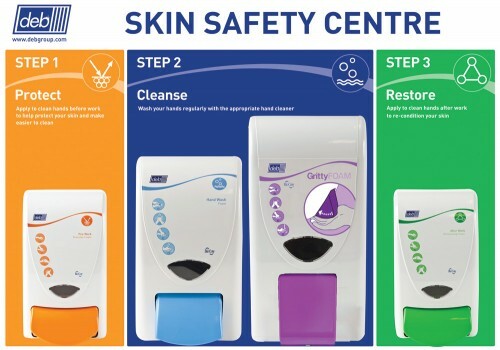 It also has 2 cleansing dispensers - 2L and 4L. Finally it has a 1L restore dispenser for the application of an afterwork cream. Size 570 mm wide x 455 mm high. 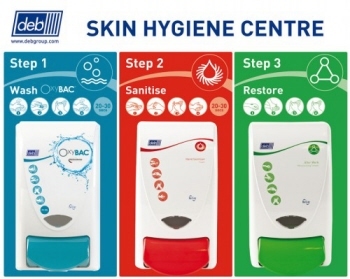 Contains:1 x Cleanse Antibac 1000 dispenser, 1 x Sanitise 1000 dispenser, 1 x Restore 1000 dispenser. 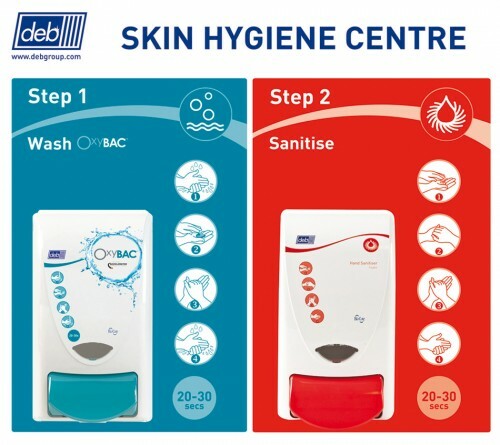 Deb OxyBAC 2-Step Skin Protection Centre specifically designed for use in any food and catering environments. Deb OxyBAC 3-Step Skin Protection Centre specifically designed for use in any food and catering environments. 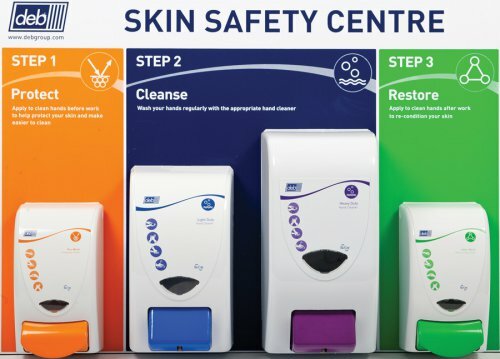 Deb Stoko GrittyFOAM Skin Protection Centre for use with Deb products to create a tailored skin care system for use in heavy duty & general industrial areas to provide skin protection and food & catering areas to provide hand hygiene. 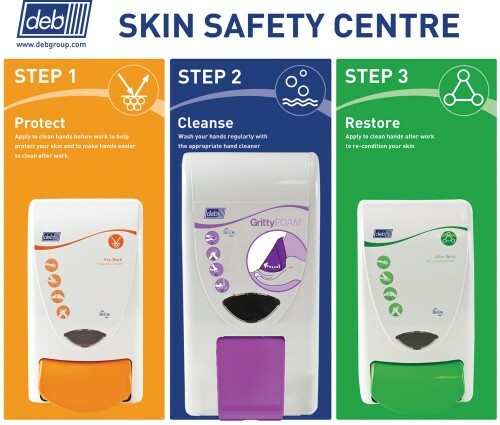 Deb Stoko GrittyFOAM Skin Protection Centre - Small is convenient 3-step where everything needed for clean healthy skin in one location.